I didn't know the little leak of my intention of selling my flat to finance my party's election campaign would create such a hype on the internet. I didn't even tell the real reason behind my sale of my flat when I mention it to my property agent friend and an associate. But they know me long enough to second guess my real intention. Out of good intention, they make it public. I hereby send my heartfelt thanks to many of my friends and supporters for their encouraging words and support. When the going gets tough, I will get tougher. 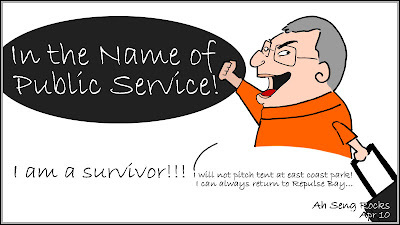 Don't worry about me as I am a survivor and I would definitely not pitch tent on the beaches to live for the rest of my life although I do like to camp outdoors once a while. I am especially touched when friends from the old days send messages to show their support. Touched because as old friends, they understand me well and have that trust and confidence in me that I would really make sacrifices for social-political causes if there is a necessity to do so. They would not believe in other people's skepticism of my move and stood firmly behind me by giving me and family the uncompromising support and comforting words. Initially, I do not wish to comment on the matter and to let it die down. But Mr. Tan Kin Lian wrote an email to me to seek clarifications. I have high respect for Mr. Tan who have selflessly stood up and fought for the Minibonds victims in 2008. Out of due respect, I made my first clarification on this matter. But the key message here is not about why I have to sell my flat to finance the party's overall strategic electoral campaigning. Definitely not about how great or silly it is for me to do that. The key messages are: Freedom is not Free and Politics is Public Service which requires just a little sacrifices from everyone. I have tried to play the issue down by persuading reporters not to write about it. The reason is simple, Politics should be Public Service and it is expected of all players, both opposition as well as ruling party politicians to make sacrifices. My little sacrifices here is dwarfed when compared to many politicians in the world, past and present. Politicians like Dr Sun Yat Sen have practically sold out everything they have just for their pursue of their political dream. Some have even laid their lives down for their political beliefs. In Singapore, the late Mr. JB Jeyaratnam has also make tremendous sacrifices by selling off his assets just to pay for his heavy political price exacted by his opponents. I do appreciate the supportive comments and responses that I am getting while I read those skeptical comments with an open heart. Both supportive and sneering comments gave me the same enlightenment somehow. It seems that Singapore has long lost the sense and spirit of Public Service. Supporters, well wishers and friends alike, are "touched" by this little mention of sacrifices basically because they have not seen such acts of willingness to make sacrifices, no matter how small it is, for the political betterment of the society. Similarly, for those skeptics who have been brought up in this materialistic environment social engineered by the PAP government for the past decades, would not believe that there would be people willing to make sacrifices in Singapore's opposition politics, which is always viewed as the "Lost Cause". I cannot stop people from being skeptics neither can I do mind control over them. But I can only tell you about what I know which has happened and still happening in opposition politics. There may be some people who are still selfish, self centred or insincere in many parts of Singapore's society, including politics. However, I can safely tell you that there are still a small group of people who have made sacrifices throughout the years and decades to sustain the effort of opposition parties. They are the unnamed heroes of opposition politics in Singapore. Some of them have passed away but hopefully there are still younger ones to pass on the spirit of public service in politics. When I was in Workers Party prior to GE 2006, I have seen many of these veterans working quietly on the ground every Sundays and on every major occasions. Most of them are unknown to the public as they have not stood for elections at all. When the elections is near, Mr. Low Thia Khiang himself has offered to sponsor my election campaign if I need it. Although I have turned down the offer as I could well afford it myself, but I appreciate his selfless dedication of wanting to groom the next generation of opposition politicians by financing them in elections. I also know that Dr. Tan Bin Seng has sponsored quite a number of candidates as well. Similar observations are made when I joined National Solidarity Party. There are veterans who have worked quietly for past years and decades, contributing to the party's cause. Sebastian Teo, the present President of NSP has also committed himself to groom and finance good potential candidates to stand for elections if necessary and if they are willing to stand. Some may look down on the little bits of contributions by these people but let me tell you a story. During Buddha's time, there was a beggar who have sold his hair for that little money to buy a small bit of oil. He intended to offer the oil to Buddha but was stopped by the monks outside the shrine because he was smelly with very untidy dressing. However, Buddha summoned him in and accepted his offer. After accepting his offer, Buddha then gave a sermon to his disciples. There were many kings, princes and rich men making huge offerings to Him but compared to what this beggar has offered, their offerings were insignificant. The beggar has given all he has to offer Him and such merits are very much bigger than those kings, princes and the rich. Thus we should not look down or belittle the every little bits of sacrifices and contributions that all these unsung heroes behind the political screens have given to Singapore. We should treasure it as our heritage of selfless spirit. These people are the pillars of Democracy. It dawns on me that as leaders of an opposition party, it is our responsibilities to keep the party going. In view of Sebastian's commitment to make money the LEAST PROBLEM for good people to step forward and contribute to the cause of political plurality, I decided to do my little part to contribute to the war chest as well. Thus the decision was made to sell my little 4 room flat to raise that funding. It is nothing much actually because I am brought up by my parents to understand the importance of society before self. My late father has taught me that politics should be about public service, to serve the people in selfless ways. The role of the government is to take care of the people's interests...etc. I would like to take this opportunity to remind everyone, including myself and other opposition members that Freedom is NOT Free. Our democratic existence is built upon the many sacrifices, big and small, of many people, past and present. I was told by someone that some "interesting" people are "watching" me. These are the "elders" in the past and present political field. Frankly speaking, I am not surprised at all. Even for the elder PAP cadre members, I believe that they have contributed selflessly to their political beliefs during their youth. I also believe that they are disappointed that they could no longer see the kind of spirit of Public Service that should exist and maintain in modern days. I also believe that these old guards of yesteryears will agree with me that their PAP government should honor the social obligation of providing cheap public housing to Singaporeans as this was and should still be the democratic socialist ideal of land reform and redistribution. I believe that there are still some elder PAP cadre members who are just like Mr. Tan Kin Lian who still hold true to his own ideological belief of social and economic fairness. Mr. Tan, as an ex-PAP cadre member, has taught me one very important thing during the Minibond saga, FAIRNESS. I was told he left NTUC because he couldn't compromise his sens of FAIRNESS, in the socialist way of providing FAIR returns and insurance coverage for the NTUC policy holders, in exchange for the profit maximizing direction. I have great respect for him not only for his effort in helping the Minibond victims but also his uncompromising sacrifices made to uphold the very values he believes in. These are all little sacrifices that wouldn't be known to the public if nobody mention about them. I hope that Singaporeans should not just see my little grass in the forest without realizing that Singapore does have a tradition of people making sacrifices for the betterment of the society politically, in the name of Public Service. Thank you Mr Goh for your selfless sacrifice. Politics have always been public services. It has only been perverted by the ruling party that someone one must pay crazy salary to attract top talent to serve in government. I wish you all the best and I hope that the people in Tampines can open their eyes and make the right choice in the coming election. Just a message for my fellow Singaporeans. Please do not expect good men to hang around and sacrifice forever. High time PAP MPs be replaced by good men. All the best to you, Meng Seng. Although, your chances of winning in Tampines is like winning Toto, but your spirit will live on. You have set a shining example to both PAP and Opposition that when you do something, you go all out and not half-heartedly (po fu chen zhou). As long as you don't get sued by PAP, you should have nothing to worry about. Choose your GRC team carefully, because you don't want your efforts to go down the drain because of other people's careless and mindless actions. I digress into the part where you mentioned TKL's actions and his history with NTUC. Everyone does things for certain agenda. Let's just say his story is not as what you have heard. For someone who is earning in excess of $750K ~ $800K annually (from NTUC's annual report), to get booted out of the cooperative, it is more than just because of "fairness" and returns (or lack of) factor. For what it is worth, many people (incl. me) dropped our policies during his term because of poor yields. i would believe that you are also interested in Chinese education in singapore. Presently it is facing a crisis whereby PAP gahmen is trying to reduce the MT weightage in PSLE in near future. Such a move is drastic and would kill our Mother Tongue, I sincerely hope that you would give your view on this matter. Thank you. I have long given up on the Chinese language education here in Singapore. This is basically why my daughter is studying in Hong Kong. At the age of 6, she could write many Chinese characters, more than a 9 year old student here in Singapore. And that's in Traditional Chinese Characters. I am totally speechless when the PAP government announced about its recent intention. I mean, the Chinese standards is already at all time low, no other places which are having Chinese language curriculum have such a low standard ever and yet, I am really speechless when the Ministry of Education could think of such a way to further diminish its importance and standards! Well, this is natural, I guess, when you have ministers who do not really put any focus on language education other than the English language to be in charge of the Ministry of Education. There is really nothing I can do without being accused as "Chinese Chauvinist" politically. As an individual, I taken care of this by allowing my child to be educated elsewhere. Choose your terrain and focus on it. You need to be known. The objective is to win the elections. I hope you will win. Other Singaporeans may think this is another show but you can prove to them that it is not. You got to show them that this is the cumulative effort of blood, sweat and tears. Also, follow the Obama campaign. Hi sir, i met you today, the 28th of april, for the first time at a coffee shop in tampines. I spoke to you for a bit and I got to know more about you. I did not know you before this honestly, and I did some research and am inspired by your sacrifices. I do hope to get to meet you more and discuss with you the issues regarding singapore. however, with that being said. I believe your approach was a tad confrontational. I could see certain people were peeved when you approached them when they were eating. They however need to know of the sacrifices you have made and the plans and ideas you have for them. This needs to be put across in a slightly better way. And i do hope you manage to get more people on your side. I do hope to hear more from you as well as all the other candidates contesting in tampines, be it nsp,wp or pap. We will take note of your feedback here. There are actually a whole list of exciting blogs with very good analysis in the internet. I will be putting up a list shortly.